Proposed building to rise on landmarked site between Bleecker and Houston streets; step one will be tough battle to win the hearts and minds of Landmarks Preservation Commission. New York University plans to begin the public approval process for the construction of a new tower for faculty housing and a hotel on its University Village site between Bleecker and Houston streets, this fall. The tower is a key component of the school's huge 2031 expansion plans. The proposed building, described as a “slender pinwheel tower,” will be located on Bleecker Street in a landmark site, which means NYU needs approval from the Landmarks Preservation Commission to proceed. NYU has announced its plans at recent community board meetings and to Borough President Scott Stringer's Community Task Force on NYU Development. The new tower will be built in the site known as Silver Towers, which consists of NYU faculty housing designed by renowned architect I.M. Pei in the 1960s. That site was landmarked two years ago. It's unclear how high the new tower will be, but it has been reported to be 40 stories high. NYU's 25-year growth plans call for the addition of 6 million square feet of space over 25 years. Half of that will be in Greenwich Village and areas surrounding Washington Square Park. The NYU Task Force has expressed its concern over the expansion and issued a recommendations report. “It is clear that the area around the NYU core and surrounding neighborhood cannot accommodate NYU's planned future growth and that those neighborhoods are already oversaturated with NYU facilities,” the report said, adding that the school should consider remote sites outside its existing footprint. Earlier this month, lower Manhattan's Community Board 1 reportedly urged NYU to build the new tower downtown nearby the World Trade Center site. On Monday, a public hearing will be held by Community Board 2's arts and institution committee on the sustainability aspects of NYU's expansion plan. The poor Village: a malignant tumor keeps growing inside of it, and the host is being consumed. ^ Oh, it's not so bad, MG; an additional high-rise to take its place with the others. Isn't it replacing a one-story supermarket? And therein lies the problem. The cancer. You can't witness one institution ceaselessly leveling block after block of historic structures in one delicate area and not reach my conclusion. What's even worse, this ridiculously wealthy institution does not have the civic pride to construct buildings worthy of the location. Imagine that, when the city's name is actually part of their institution's name! It's enough to boil the blood. They're littering the Village (East Village too, now) with banal dorms that look worse than a SUNY school instead of structures more befitting a world class institution and a world class neighborhood. Isn't it replacing a one-story supermarket? Actually the plan is to tear down the supermarket and leave a large portion of that lot at the intersection of La Guardia Place and Bleecker as open space (supposedly). The 40-story tower will be built on a plot just to the east of that, where Greene Street now runs into Bleecker (thereby removing that part of the street and cutting off direct pedestrian access, which runs north <> on Greene from Canal Street all the way through to Washington Square South / 4th Street). The tower will go up on part of the recently landmarked parcel that includes the three IM Pei Silver Towers. The "pin wheel" plan for the new tower will slot it into that NW corner of the protected parcel, which was designed with open space as part of the intrinsic design, the 4th corner of the plot kept as a void to balance the mass of the three towers. So, purely form an aesthetic POV it's not the best site. But NYU can build as of right on the supermarket plot, which would put the tower pretty much directly on the corner -- a site that is actually more problematic, as the tower would be much more visible, both from Washington Square when looking south and from Soho when looking north up West Broadway. And it would be far more "present" when viewed from the west along Bleecker. Pushing the tower more to the middle of the block puts it in the company of the tall neighbors of ST and Washington Square Village on the other side of Bleecker. I'd much prefer a few fantastic tall buildings here and there rather than a continuation of the banal blocky crud that NYU has erected along Third Avenue (or the terrible Kimmel Center on WSP). What NYU must do is come up with a stunning tower. But they've shown that when it comes to architecture they have their heads up their well=paid arses. Also, locals are crazily opposed to lots of glass (I've actually heard folks on the Board at CB meetings state, "We don't like glass" !). And they hate height to almost any degree, so it will be big fight for NYU to get the plan through. Seems they have the stamina and the checkbook to go that route. At least NYU can't play the Goldman Sachs / Bank of America game and claim they'll pack up and move to Jersey if they don't get their way. The 40-story tower will be built on a plot just to the east of that, where Greene Street now runs into Bleecker (thereby removing that part of the street and cutting off direct pedestrian access, which runs north <> on Greene from Canal Street all the way through to Washington Square South / 4th Street). Move the tower directly to the corner, and you solve this problem. But NYU can build as of right on the supermarket plot, which would put the tower pretty much directly on the corner -- a site that is actually more problematic, as the tower would be much more visible, both from Washington Square when looking south and from Soho when looking north up West Broadway. And it would be far more "present" when viewed from the west along Bleecker. Pushing the tower more to the middle of the block puts it in the company of the tall neighbors of ST and Washington Square Village on the other side of Bleecker. Also not so bad. I can still see myself walking home on Bleecker. I always thought: what a pity there isn't a high-rise above the supermarket. Still think that; nothing much has changed. What NYU must do is come up with a stunning tower. ... locals are crazily opposed to lots of glass (I've actually heard folks on the Board at CB meetings state, "We don't like glass" !). They've finally figured out that a glass skin is the enemy of scale. More power to them! I say build another of Pei's towers, and build it directly on top of the supermarket --but make sure a supermarket appears when the dust has settled. Last edited by ablarc; May 16th, 2010 at 11:55 AM. The NYU march of progress continues apace in Greenwich Village, where the University's new building for budding legal eagles is nearly complete, and has the bricks to prove it. This is Wilf Hall, six floors of new construction over and around the old Provincetown Playhouse just south of Washington Square Park, a piece of history that was sort of saved by preservationists. The new project is from the minds at Morris Adjmi Architects, and shows five stories of brick frontage with an illuminated canopy near West 4th Street. Barely seen from the street is a set back sixth floor, faced in metal panels and topped by a green roof (no doubt the greenery will be much appreciated by at least one nearby neighbor). This is the final building in the Master Plan for the NYU Law School, housed in multiple buildings across MacDougal and points east. Inside the nearly 44,000-square-foot structure a reconfigured Provincetown Playhouse will share space with facilities at Wilf Hall, a "think tank" for legal research and inquiry. Those studies could come in handy as NYU's development dreams meet the reality of NYC bureaucracy and Greenwich Village commandos. South Village superblocks, specifically showing the current conditions. New York University is planning to apply for a major rezoning of its two South Village superblocks, which, among other things, would allow it to build a planned tower up to 38 stories tall — which would be half residential and half hotel — on its southern superblock. The two extra-long, N.Y.U.-owned superblocks are located between W. Third and Houston Sts. and LaGuardia Place and Mercer St. Without the rezoning, N.Y.U. would only be able to build the tower half as big, since the block’s current zoning doesn’t allow that much residential development; N.Y.U. also would be unable to include a hotel in the tower, since the block’s current zoning forbids transient hotels. Also part of the plan, N.Y.U. is seeking to demap and acquire narrow strips of property currently owned by the city’s Department of Transportation on the sides of the superblocks along Mercer St. and LaGuardia Place. The Villager learned about the proposal — which would change the megablocks’ zoning from R72 to C62 — when it was recently leaked to the newspaper by a community member on the Borough President’s Community Task Force on N.Y.U. Development. The task force’s discussions are supposed to be confidential. Told that The Villager was aware the proposal was for a C62 rezoning, Alicia Hurley, N.Y.U.’s vice president for government affairs and community engagement, agreed to meet with the newspaper to explain the plan’s details accurately. Joining Hurley at the meeting with The Villager last Thursday were William Haas, N.Y.U.’s planner; and Bob Davis, the university’s outside land-use counsel. Though their hand was forced by the task force leak, Hurley stressed the university hadn’t intended to make the plan public yet. “This is a very sensitive time for us,” she said of the rezoning, which is certain to draw fire from community opponents. Although N.Y.U. has commenced discussions about the rezoning with the task force, it hasn’t shown the plan to the Department of City Planning yet. Right now, Hurley said, the university is “exploring ideas,” and the plan isn’t finalized. At the meeting with The Villager last week, the three first laid out the complicated history of the superblocks, which also include the smaller N.Y.U.-owned superblock to the north, between Washington Square South and W. Third St., home to N.Y.U.’s Bobst Library. The three superblocks comprised the Washington Square Southeast Urban Renewal Area, approved in 1954 as a Title I “slum clearance” project. In this case, however, it wasn’t a residential “slum” being cleared — there were less than 140 residential tenants living on the site — but mainly old commercial and manufacturing loft buildings. To create the three superblocks, Wooster and Greene Sts. were demapped from Washington Square South/W. Fourth St. to Houston St. Also, Mercer and W. Third Sts. and LaGuardia Place were widened to improve traffic flow as part of the city’s plan for a crosstown Lower Manhattan Expressway, which was ultimately defeated. In 1955, the northern so-called “education block” was conveyed to N.Y.U. via an educational deed, while the two southern superblocks — dubbed “housing blocks” — were conveyed from the city to a private developer. In 1961, the Washington Square Village residential complex was completed on the middle superblock, along with the accompanying, low-rise retail strip on LaGuardia Place, plus the supermarket across the street at the corner of LaGuardia Place and Bleecker St. In 1963, the Washington Square Village superblock was sold to N.Y.U. by a private developer. The same year, the still-undeveloped southern superblock was also sold to the university by a private developer. The urban renewal plan was amended four times over the years. In 1958, it was changed to allow construction of the supermarket at LaGuardia Place and Bleecker St. The second amendment, in 1962, designated the southern superblock as “residential,” except for the supermarket site, which was designated “retail.” Following this amendment, in 1964, a large-scale residential development plan, or L.S.R.D.P., was approved for the block, allowing N.Y.U. to construct its three-building University Village (Silver Towers) complex, which it completed in 1967. In 1966, the plan was amended to allow N.Y.U. to take over the block-long strip of LaGuardia Place between Washington Square South and W. Third St. so it could build its Bobst Library that much wider, and also to construct the library with sheer exterior walls, without the required setbacks. The last amendment came in 1979, when the southern superblock’s eastern end was designated “educational” to allow development of N.Y.U.’s Coles gym. (Originally, the Coles site was to be a residential building.) Construction on Coles finished in 1981. Where all these plans and amendments leave N.Y.U. today is basically trying to figure out, first of all, when it could even start development on its superblocks — which is a key component of its 2031 growth plan: As part of its long-range expansion scheme, N.Y.U. hopes to add up to 1.5 million to 2 million square feet of space in its “campus core” around Washington Square, mainly on the two superblocks. One key question for N.Y.U. is when the deed restriction tied to the urban renewal plan expires. Generally speaking, the expiration is 40 years after the project’s completion — until then, what’s on the ground cannot be altered, and new additions cannot be made. Did the clock start on the deed restriction’s expiration in 1967, when Silver Towers was completed, or in 1981, with Coles’s construction? If it’s the former, then the restriction ended in 2007, and N.Y.U. could start developing on the superblocks, assuming it got the needed zoning changes. But if it’s the latter, then the restriction would still be in effect until 2021, and N.Y.U.’s development plans would have to be put on hold. Land-use counsel Davis predicted the city’s Department of Housing Preservation and Development would take the “conservative” view and say the deed remains in effect till 2021. If that’s the case, N.Y.U. would then try to have the restriction modified, he said. H.P.D. can administratively change the restriction, they noted. “The deed restriction will probably be the simplest thing to be done,” Hurley said. She added the plan will undergo a public review under the city’s uniform land-use review procedure, or ULURP. The N.Y.U. officials and Davis next proceeded to flesh out the new plan’s details. First, they stressed that N.Y.U., in taking over the D.O.T.-owned strips, wouldn’t use the air rights from these parcels to add bulk to its development projects. However, the university does want to extend out onto the Mercer St. strip the new academic building it would construct on the current Coles site. In return, as a public amenity, N.Y.U. would widen the alley-like remnant of Greene St. on the Coles site’s west side. Currently, the area to the east of the superblocks — between Mercer St. and Broadway — is zoned C62, and N.Y.U. would like to extend that same zoning onto the superblocks, replacing the current R72. This zoning change would increase the residential floor area ratio (F.A.R.) from 3.44 to 6.02. (Floor area ratio is a relation of the property’s footprint to the floor space that can be constructed within the building.) In short, a 6.02 residential F.A.R. would allow construction of the 38-story tower, while a 3.44 residential F.A.R. would be insufficient for a building of that size. N.Y.U. wants this new fourth tower it would add in its University Village complex to be half for faculty housing and half for a hotel for visiting N.Y.U. faculty from abroad and others, such as visiting parents and students. The block’s current zoning has a 6.5 F.A.R. for community facilities (such as dormitories), which would allow a 38-story tower — but neither faculty housing nor a transient hotel are allowed under this use group. Under the rezoning, the block’s community-facilities F.A.R. would remain at 6.5, but the allowable commercial F.A.R. would jump from 2.0 to 6.0, which would allow a taller, mixed-use building on the current Coles gym site. Current zoning doesn’t allow new buildings to be added to the southern superblock, neither a fourth tower nor new construction on top of the existing Coles gym. However, Hurley said, that under N.Y.U.’s proposed C62 zoning, “more of the lot can be covered,” which she acknowledged is “another potential flash point” with opponents. This aspect would be seen at the Coles site, whose 23-foot-tall rooftop is currently considered “open space.” If a bigger building — with a new underground gym — replaced Coles under the plan, this rooftop open space would be lost. The design for the new building’s rooftop is a severe zigzag shape, which would seem to make it unsuitable for recreational use. However, the Morton Williams supermarket would be moved from the block’s northwest corner to the ground floor of this new building at the block’s southeast corner (on the Coles site), freeing up the former Morton Williams site to be turned into a public open space. “The nuance here is that we think we can return this to actual open space,” Haas said of transforming the supermarket corner into a public open space. Hurley noted N.Y.U. is “investigating” exactly what happened with that playground. According to a brief history of the superblocks that was provided to The Villager, the Coles rooftop playground included “a play fountain, clatter bridge, slides, cargo net, vertical rope swing, play deck, play cubes, kickball area, shade trellises and basketball court.” The basketball hoops, however, were removed the first week the playground was open after a basketball went flying off the rooftop and through the windshield of a car traveling on Houston St.
On the Washington Square Village superblock, the buildings are currently constructed to an F.A.R. of 4.1. The taller of two infill buildings that the university would like to add in the complex’s courtyard, on the Mercer St. side, would have an F.A.R. of 5.4. Current zoning doesn’t allow new buildings to be added in the block’s interior. The two infill buildings — preliminary designs of which Andrew Berman, director of the Greenwich Village Society for Historic Preservation, likened to “Space Mountain” — would extend out onto the Mercer and LaGuardia strips. Hurley confirmed that the smaller of the two infill buildings would poke out right onto the Mercer St. strip where the iconic statue of Fiorello LaGuardia is located, so the “Little Flower” would have to be moved a bit. The D.O.T. strips are currently 35 to 40 feet wide on LaGuardia and 30 feet wide on Mercer; a 15-foot-wide walkway would be kept, even with the infill buildings projecting out, Haas assured. The commercial area of the low-rise retail strip along LaGuardia Place essentially would be relocated a block south into the new mixed-use building on the Coles site. To shift these commercial uses around would require city approval of what’s known as a general large-scale development plan, or G.L.S.D.P. — similar to what The Cooper Union did eight years ago when it embarked on its rebuilding plans in the East Village. The G.L.S.D.P. would replace the existing L.S.R.D.P. (large-scale residential redevelopment plan). In addition, N.Y.U. wants to rezone the blocks to the north of the superblocks and east of Washington Square Park to allow it to add retail uses on the ground floors of its buildings there. These uses would mainly be “convenience retail — to serve the university community,” Davis explained. “Not big-box retail,” Hurley assured, adding the shops will be similar to what can now be seen here along Waverly Place. N.Y.U. also wants to extend the sidewalk 15 to 20 feet into W. Third St. between Mercer St. and LaGuardia Place to align it with W. Third St. to the east and west. As for the hotel in half of the planned fourth tower that would be added to the Silver Towers complex, Davis said visiting faculty — such as from the campuses of N.Y.U.’s far-flung “Global Networked University” — would stay there for a fee. The tower’s other half would offer rental housing for faculty, possibly with condo purchase opportunities. Davis explained that, for example, N.Y.U.’s Stern School of Business might want to buy a block of apartments in the building. Per city regulations, the hotel portion would have to offer basic hotel services, with a central switchboard and so forth. To add the fourth tower to the Silver Towers complex, N.Y.U. also would need approval from the Landmarks Preservation Commission, which landmarked the three buildings and their grounds in 2008. If all goes according to plan, the university will make its application to L.P.C. this fall, and then, in 2011, would apply to City Planning for the rezoning as part of a general large-scale development plan. On the other hand, if all of its plans are rejected, N.Y.U. would then focus on trying to develop on the current Morton Williams supermarket site at Bleecker St. and LaGuardia Place in 2021. New York University officials are eyeing lower Manhattan -- including a tower at the World Trade Center -- as part of their 20-year plan to dramatically expand campus housing, classrooms and other services, The Post has learned. In a letter to the Port Authority and Lower Manhattan Development Corp., NYU Vice President Lynne Brown has requested a meeting with rebuilding officials to determine which downtown sites are available for campus expansion. The university is planning to add 6 million square feet of new space, about half of which would be built in the college's core area in and around Greenwich Village. But Brown said the university can't meet all of it needs in the historic neighborhood. "For that reason, we would like to discuss lower Manhattan as part of our exploration of remote sites," she wrote in a letter dated June 11. Brown cited community officials who have advocated that NYU move into the World Trade Center's yet-to-be-built Tower 5, which is slated for the site of the former Deutsche Bank building now being demolished. Tower 5 is expected to include 1.3 million square feet of space. The PA is looking for a developer willing to build either an office tower or a combination hotel and housing high-rise on the site after it's cleared by the end of this year, which would fit in with NYU's plans. "We're certainly willing to meet with NYU and pleased that there is so much continuing interest in the site during its building," said a PA spokesman. Brown said she wants to meet with LMDC officials to learn about any opportunities available downtown and "to assess whether there is some role that the university can play to help revitalize and diversify the area." Under NYU's expansion plan, the university's campus would grow by 40 percent over the next two decades. So far, officials have identified Downtown Brooklyn, a corridor along First Avenue in Manhattan -- near NYU's medical center -- and Governors Island as possible sites for growth. Sources familiar with the university's plans insist that Tower 5 would not be used to replace a proposed 40-story tower that NYU still wants to build on Bleecker Street, which is the most controversial element of the expansion plan. Julie Menin, chairperson of downtown's Community Board 1, said a move by NYU to expand in lower Manhattan would find broad community support. "I raised this idea a number of weeks ago," Menin said. "I'm very pleased they are taking this idea seriously. "I think it makes sense for a whole lot of reasons. Tower 5 is perfect for them." Community officials in Lower Manhattan have made it pretty clear that they'd like a piece of the ever-expanding NYU pie in their neighborhood, and as recently as yesterday, it looked like NYU was receptive to their overtures. According to a letter from an NYU VP, the university was even looking at the World Trade Center's Tower 5, to be built on the site of the Deutsche Bank building. But FiDi woke up today to discover it was all a sweet, out-of-reach dream. DNAinfo checked with NYU officials, who say the university cannot afford to developer Tower 5. Community Board 1 is still campaigning for NYU to take part of the tower, and the university does plan to explore other sites in Lower Manhattan. But it looks like anti-NYU Villagers can't rely on FiDi to ride to their rescue. Perhaps more animations would do the trick? New York University on Thurs., June 17, publicly released images of the 38-story tower it plans to add to the landmarked, three-building University Towers complex at Bleecker St. and LaGuardia Place. The images were reproduced first in the Wall Street Journal. Grimshaw architects, courtesy of N.Y.U. in the center, viewed from the south. since it would block their light and views to the north. Two weeks earlier, on June 2, The Villager first reported about N.Y.U.’s plans for the fourth tower, as well as the university’s overall plans for its southernmost South Village superblock, between Mercer St. and LaGuardia Place and Houston and Bleecker Sts. As reported in The Villager article, top N.Y.U. officials told the newspaper that the tower would be half residential for N.Y.U. faculty use and half hotel for university-affiliated visitors. According to an N.Y.U. press release — “NYU Shares Plan for a Fourth Tower on Landmarked University Village Site” — the siting of the fourth tower “best preserves the view corridors for the existing University Towers buildings and particularly 505 LaGuardia Place.” N.Y.U. also owns the Morton Williams supermarket site at the southeast corner of Bleecker St. and LaGuardia Place — but building the new tower there would block the views and light of 505 LaGuardia Place, which is a Mitchell-Lama co-op and not owned by N.Y.U. If N.Y.U. developed the new building within the University Towers complex it would be 270,000 square feet, while if it built it on the Morton Williams site it would be 250,000 square feet. The new tower would be contextual with the existing three towers, with a similar style and design theme, though wouldn’t be an exact replica. 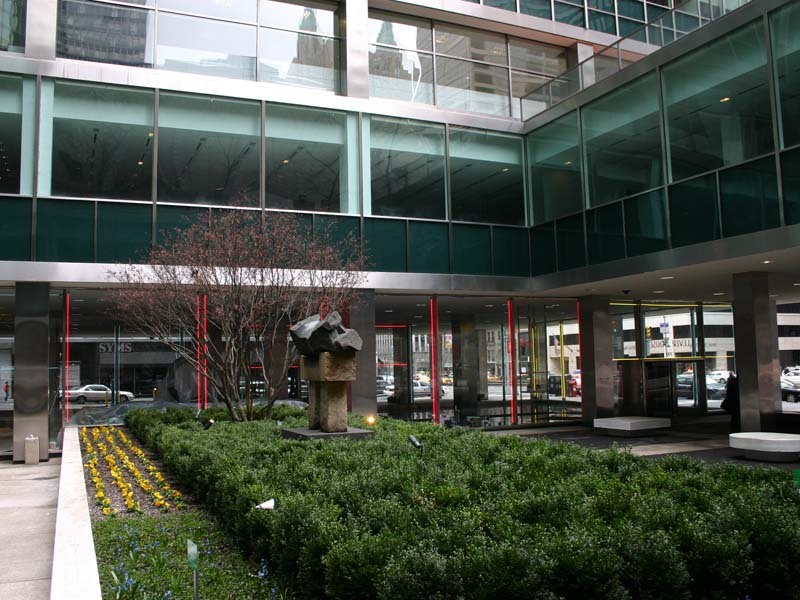 The university’s efforts to build within the landmarked University Towers complex will need approval of the city’s Landmarks Preservation Commission, for which the university will apply in the fall. N.Y.U. will also start a formal ULURP, or uniform land use review procedure, in the coming months for both of its South Village superblocks. N.Y.U. also owns the Washington Square Village superblock just to the north. However, if the option of building the fourth tower in the University Towers complex isn’t available, N.Y.U. would instead build on its Morton Williams site in 2021; N.Y.U. would have to wait till that date to build because of a deed restriction the property still carries from having been developed as part of an urban renewal area decades ago. The 2021 restriction may also apply to both of the superblocks, though N.Y.U. is trying to clarify with the city whether that is the case. In addition to the fourth tower, the plan for N.Y.U.’s southern superblock also includes rebuilding its Coles gym site with a larger building, with a mix of retail on the ground floor, academic uses and student housing, and a new belowground gym. On the Washington Square Village superblock, between W. Third and Bleecker Sts., N.Y.U. plans to seek approvals to add two infill-type buildings at the east and west ends of the complex’s central courtyard. The new buildings would project out a bit onto two currently city-owned strips of land on Mercer St. and LaGuardia Place, forcing the relocation of the Fiorello LaGuardia statue on LaGuardia Place. N.Y.U. also will try to acquire these city-owned strips bordering the superblocks, leftovers from when the city was planning to widen these streets back in the mid-20th century to improve traffic flow for the planned crosstown Lower Manhattan Expressway, which was never built. Last edited by Merry; June 18th, 2010 at 07:49 AM. ^ NIMBYs hard at work doing not much useful. Most of them aren't even NIMBYs, since this site affects few people. I want to see how LPC navigates this situation. Two years ago they landmarked the entire I.M. Pei Silver Towers plot, encompassing his three towers and the open space surrounding them. Now NYU will ask them to negate that designation and allow another structure to rise that will partially fill the void that's so essential to Pei's composition. If they say OK here then why not allow a tower to rise in the middle of the Lever House courtyard? After all, it's just some old building that's been declared important by a bunch of know-it-alls.